Old Toasters, Mixers and Blenders—Oh My! Fashionable kitchens and laundry rooms aren't above including vintage electrics these days. The small appliances of yesteryear were made of metal, heavier than today’s plastic versions, and they have an appealing vintage look to them. And considering that many older appliances are still working after all these years, maybe newer isn’t always better. For those with a penchant for the unusual, you can even find a vintage necktie iron if you look around for a while. Of course, most modern men don’t want to think about wearing neckties much less ironing them. Still, these curiosities from yesteryear can make interesting conversation starters in the right setting. If you don't want to get quite that far out there, there are lots of more practical options to consider. One of the best aspects of hunting down old appliances is the bargain price still found on many of them. Old Sunbeam “Mixmaster” stand mixers in common colors can be found at garage sales and estate sales selling in the $15 to 50 range. You can find them in antique shows and shops too, but those will generally be priced higher. What else can you find for a vintage themed kitchen? Just about everything we use today like toasters, blenders, electric skillets, and waffle irons. If you look hard enough you’ll even find old electrics that match your own decorating scheme in terms of style or color. If you’re trying to recreate a 1950s kitchen, for example, a vintage red and white Knapp electric blender might work well for you. Or, how about a pink electric stand mixer? Just keep in mind that out-of-the-ordinary colors like these will likely be more expensive than a plain white model, especially at an antique show or vintage specialty shop. Speaking of electric mixers, if you happen to be interested in them as collectibles there’s a Yahoo group called “We Actually Collect Electric Mixers" or WACEM for short, with more than 2,000 members. While most people have never heard of it, the group is a really useful resource to find out more about unusual mixing devices you might run across or obtain accessories for restoration project you're in the midst of completing. And if you decide to ardently collect mixers, like the folks in the group, you'll feel right at home there. 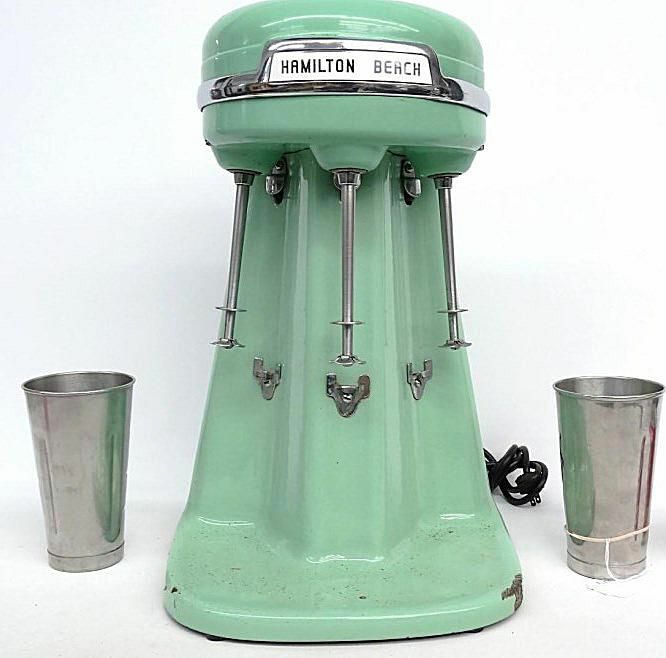 In addition to soda collectibles, many game rooms are outfitted with old soda fountain items. That includes milkshake mixers that will still do the job if you're inclined to serve some up. If you’re actually planning to use vintage appliances in your home instead of just displaying them though, keep in mind that they do have their limitations. While they’re generally heavier and were made for the long haul, old appliances do tend to warm up rather slowly. In other words, it might take a lot longer to prepare that batch of waffles with an old iron than a newer one. Crushing ice for margaritas might not be an option in your old blender either. Some of them just don't have enough oomph for that type of service. You’ll also find older electrics to be less energy efficient than newer ones, and perhaps not quite as safe if the cords are fraying. It’s wise to keep old appliances unplugged when they aren’t in use and, don’t plug too many of them into one outlet to avoid an electrical overload. All in all, though, vintage kitchen appliances can be fun to own. They take us back to the kitchens of our mothers and grandmothers and the love we found there, but what about the future? It will be interesting to see if folks will be stocking their kitchens with “vintage” George Foreman grills and Presto pizza ovens years from now. Hey, you never know.